We love those frosted sugar cookies you buy at the grocery store bakery. They’re soft and super sweet and everyone loves them. But sometimes I want to bake my own. That’s where Pillsbury sugar cookie dough comes in! I’ve got a simple hack to make semi-homemade ones any time a craving strikes. Simply add an egg yolk and some extra flour to the dough! 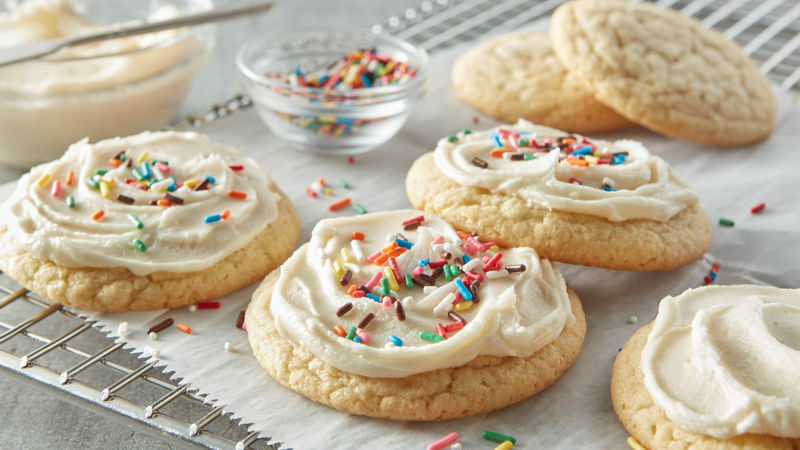 Top the cookies with a quick five-ingredient frosting and you’ve got a quick snack for after school (or after bedtime) in no time. Place 1 roll of sugar cookie dough, 1 egg yolk and ½ cup flour in the bowl of an electric mixer fitted with the paddle attachment. (A hand mixer can be used if needed.) Mix until dough is smooth. Scoop balls of cookie dough—the size of about 2 tablespoons—onto cookie sheets lined with a silicone baking mat or parchment paper. Chill dough for 15 minutes. Meanwhile, preheat your oven to 350°F. Bake chilled cookies for 12-14 minutes. Cool completely. Make frosting while the cookies are cooling. Use a hand mixer to whip up 3 tablespoons of softened butter, 3 cups powdered sugar and 1 tablespoon vanilla. Add up to 2 tablespoons of milk, a little at a time, until you get the desired frosting consistency. Frost cookies. Don’t forget your favorite sprinkles! Store loosely covered at room temperature.